i-pets.com has SAFE chicken products! As recently reported by NBC News, several popular brands of chicken jerky dog treats have been recalled because they contain trace amounts of residual poultry antibiotics which are approved in Europe, but not in the USA. i-pets.com sells pet treats which contain chicken, so we temporarily withdrew our products from our website and sent them to an independent laboratory to have them tested. We sent our chicken jerky products for testing on January 11, 2013, to Silliker Inc. The results of the testing determined that no action is required on the distribution of the chicken jerky products because the trace amounts of antibiotic residue (in the parts-per-billion range) do not pose a health or pet safety risk. 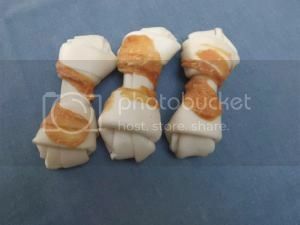 We have now re-listed banana chips wrapped with chicken, rawhide twists with chicken wrap, rawhide bones with chicken wrap, pork hide bones with duck wrap and combo triple rolls.